The activated carbon treatment provides crystal clear water – phenoles, proteins, coloring substances, odor, and coral and algae toxins are removed effectively. By buying this product you can collect up to 20 loyalty points. Your cart will total 20 points that can be converted into a voucher of CA $0.30. Carb L is an activated carbon specifically made for permanent and long-term use. Extremely pure, vapour-activated and pre-washed activated carbon for efficient removal of yellowness, turbidity and harmful toxins, essential for maintaining good water quality in any aquarium. 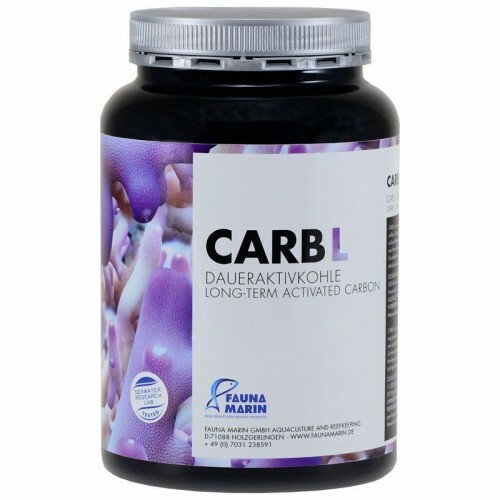 Carb L is almost entirely free of phosphate and has an extremely high capacity. Carb L is specifically made for permanent and long-term use but should be exchanged every 30 days. Suitable for freshwater and marine aquaria, cleans the water without any negative side effects. Continous aquarium water treatment using Carb L (super pure pelletized activated carbon) plays a fundamental role in the Zeo-Light-System. Carb L is essential to the keeping of sensitive SPS and LPS corals and therefore is applied permanentely. The activated carbon treatment provides crystal clear water – phenoles, proteins, coloring substances, odor, and coral and algae toxins are removed effectively. (flow rate max. 200 L ( (52 US gal lqd) /h). 2 L (approx. 1000 g) per 1000 Liter (260 US gal lqd) aquarium water if applied in a filter bag. Replace the activated carbon after 4 weeks in a fortnighly alternate routine to the zeolite change.